When it comes to temperature 2010 was a bronze medal performance in a lacklustre field. An excellent summary of the facts. If only we could get alarmists to read it! I think the worm is turning but alas they are hell bent on killing us with carbon taxes.Can we have a referrendum on carbon taxes? If you believe that a IT guy with no background in science over a bunch of trained scientist then that's you own problem. 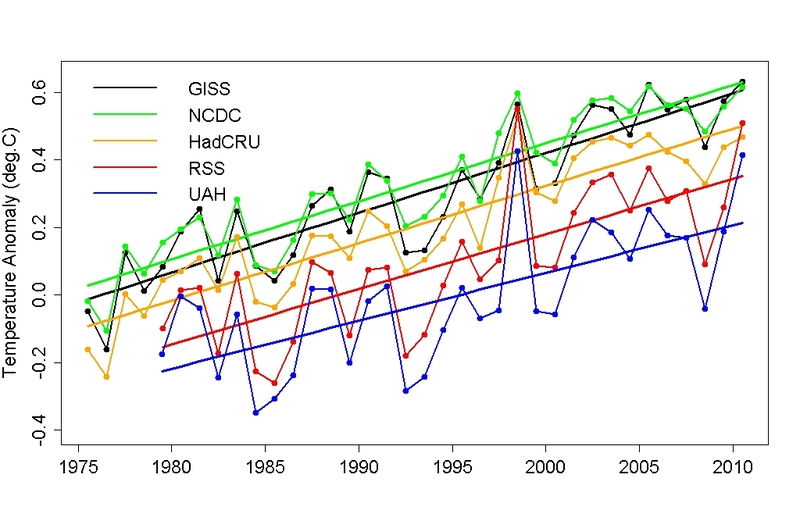 If you believe that the IT guy is going convince climate scientist that they got it all wrong. Then have I got a deal for you, would you be interested in buying shares in a little bridge over a harbour. Kenny, You don't know how to read a graph? You always defer to authority? John has indicated to me by separate email that the supposedly hottest temperatures in Arctic Canada are probably nothing more substantial than estimates, based on data from up to 1200km away. Surely there is better data than this for the Arctic? Yes Jennifer (Marohasy), there is - satellites. Would like the Australian Climate Coalition's John McLean to comment. Come on Kenny, the only thing climate scientists are expert at is writing grant applications. After all to get all that money pouring in they didn't have much time for anything else. That's why they had to pick up all that propaganda from green groups, to write into the UN's IPCC last report. They didn't have any new BS of their own to feed in there.